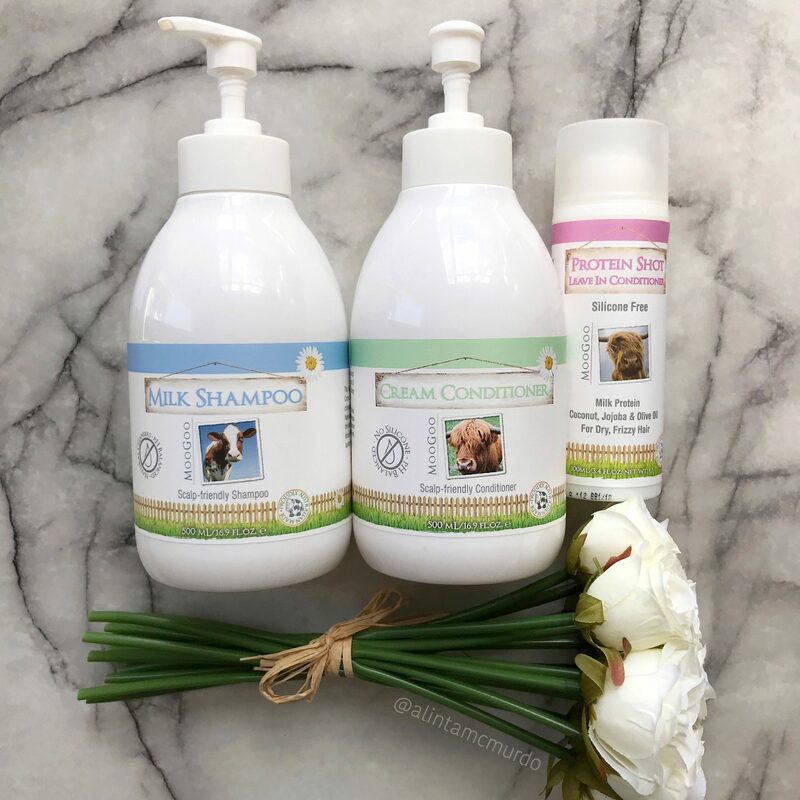 Today I have a review of the MooGoo hair care range which includes the Milk Shampoo, Cream Conditioner and Protein Shot Leave-In Conditioner. MooGoo is a cruelty free Australian brand that focuses on creating natural skincare products. There are vegan items within the MooGoo range but the three products I am reviewing today all contain milk protein. MooGoo list every ingredient in each product, not just the active ingredients, so you always know exactly what you’re getting. The MooGoo hair products don’t contain Sodium Lauryl Sulfate (SLS), Sodium Laureth Sulfate (SLES) or Silicone, which is a big plus for me. I knew for a long time that there was something irritating my scalp but I struggled to identify the ingredient until I started getting perioral dermatitis from SLS in my toothpaste and skincare products. After that, I started phasing out SLS from all my products, including hair care. It helped a lot with irritation but I was still getting some itchiness from time to time. For some reason, I had never even considered silicone as being the reason for my scalp problems. MooGoo do not use silicone in their hair care products and on the packaging of the Cream Concealer it says “Silicone can weigh down the hair and coat the scalp. This can lead to an itchy head. We use Jojoba and natural detanglers instead”. My scalp feels a lot better now that silicone is not in my hair routine but there is a small adjustment period. The first few washes using products that are SLS and silicone free was different for me as the lather of the shampoo is a lot less (still easy to use) and my hair got temporarily frizzy when the silicone was removed. I have been using SLS and Silicone free products for almost a year now, and I can tell you that they have made my hair a lot healthier in the long run than any of the products I was previously using. 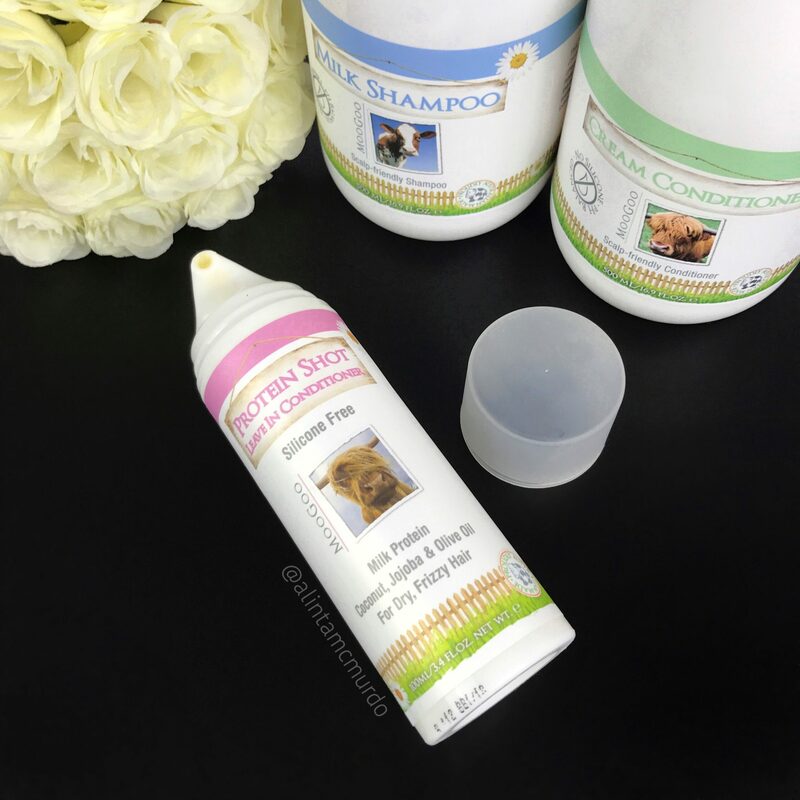 The Milk Shampoo uses coconut and glucose based cleansers to help sensitive, flaky and itchy scalps, but anyone can use it. It doesn’t foam a lot, but foams just enough to make it easy to spread the product over all my hair. I wasn’t sure if this shampoo would cleanse my hair enough to make it clean, but it does, my hair feels really clean afterwards. Both the shampoo and conditioner come in a 500ml pump bottle that retail for $17.50 each. I don’t tend to spend $17.50 on one shampoo bottle but this is a much bigger bottle than other brands and I don’t need to use a lot of this shampoo, so it doesn’t end up being too expensive per use. The Cream Conditioner uses natural ingredients like Jojoba to moisturise the hair as well as including ingredients that control the flora of the scalp that sometimes cause scalp problems for people. This conditioner does help to de-tangle my hair but I need to use a lot more of it in comparison to the Milk Shampoo (that tends to happen for me with any conditioner though). My hair can be quite dry and I have a lot of flyaways due to hair regrowing after hair loss from my illness, so I need something that can really moisturise my hair. For a stand alone conditioner, this is good, and I think it would be enough for most people, but my hair needs a post-shower treatment for extra conditioning – that’s where the Protein Shot comes in. The Protein Shot Leave-In Conditioner is a coconut, jojoba and olive oil based cream. The instructions say to massage a small amount of cream into the ends of towel dried hair. It works well this way, but I’ve used it successfully on the entire hair length and when the hair is completely dry. The Protein Shot is the highlight of these products for me. I have been looking for a silicone free leave-in conditioner for a long time now, but many of them leave my hair feeling like an oil slick or don’t help to hydrate it at all. The Protein Shot doesn’t leave my hair feeling oily or greasy but it does help to control some of my flyaway frizz. When I was searching for a leave-in conditioner, I was mainly buying sprays as all the creams I had tried previously would goop up and not spread throughout my hair evenly. I don’t have this problem with the Protein Shot. I use one pump and spread it out on both hands and then run my hands through the ends of my hair. When my hair is dry, it doesn’t feel like it has any product in it and it helps to reduce knotting of the end of my hairs. It comes in a 100ml pump bottle with lid and retails at $14.50. I only use a small amount at a time so the value per use is really good for the Protein Shot. I will definitely be buying another bottle of the Protein Shot Leave In Conditioner when my current one runs out. All three products have a scent that stays in my hair after it is dry, but it’s not overpowering. I’m not very good at identifying scents but I think there is vanilla in it, it’s certainly a pleasant smell. The Milk Shampoo cleans my hair well, the Cream Conditioner does moisturise but I need something more moisturising right now as my hair is quite dry, and the Protein Shot Leave-In Conditioner is certainly my favourite as it gives my hair extra moisturising without making oily, greasy or limp. The shampoo and conditioner have different coloured rings around the bottles which is really helpful for me as I can’t read any bottles in the shower thanks to my really bad eyesight. Leaving out SLS and Silicone is a real winner for me as my scalp is no longer itchy and I haven’t got any dry flakes. I’ll never go back to the SLS and silicone containing products I used to use, and I highly recommend you try going without them too. I have more Moo Goo products I’m testing and I will review in future so sigh up to email updates to get notified when they go up. You can check out my review of the New Eczema and Psoriasis Cream and my review of the Dusty Girls Natural Makeup. Will you be trying any of the MooGoo hair care products? Check out other posts from beauty bloggers at the Fabulous and Fun Life blog link up.